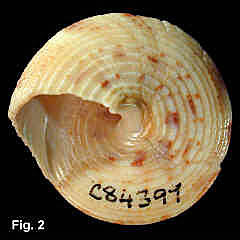 Description: Whorls straight sided, sculptured with a large rib below the suture and 6-7 finer beaded ribs on each whorl. Usually very fine riblets between the spiral ribs, particularly on the body whorl. Basal margin angled in juvenile specimens, rounded in mature shells. Base slightly convex with weakly beaded or smooth spiral ribs. Outer lip simple. Interior nacreous. Columella smooth with one weak tooth at the base. Umbilicus closed. Colour fawn with irregular reddish-brown patches and spots, columellar edged by callus tan. Size: Up to 43 mm high. Distribution: Endemic to Australia; Keppel Bay, Qld, to Wollongong, NSW. 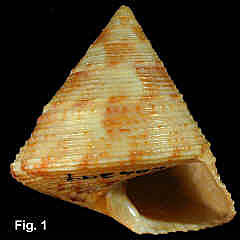 Habitat: Low intertidal to about 120 m. Uncommon.